There’s quite a story behind the babies from the Žižkov Television Tower. And now the story is becoming a mystery. Dubbed the second ugliest building in the world, the tower was the work of the Communist government, starting in1985. Designed by the architect Václav Aulický and the structural engineer Jiří Kozák, the 700-foot-tall structure was controversial in several ways. “The Bolsheviks, in the ’80s, started working on this project because they needed to have a high tower in the middle of the city to actually be able to spy on people and to disrupt the broadcasting from radio. “But the project was going on during near the end of communism and the way the Communists actually picked the place where to build it was very unhappy. They picked the middle of the city where there was a Jewish cemetery. They completely ruined all of the Jewish cemetery. During this time they were digging out skeletons. So, that’s one of the reasons. March 2006 |Author=David Bjorgen, Wikimedia Commons, used with permission. they became permanent in 2001. The 10 giant statues looked like they were crawling on hands and knees up the tower, but their cute “baby-ness” disappears if you see their faces. 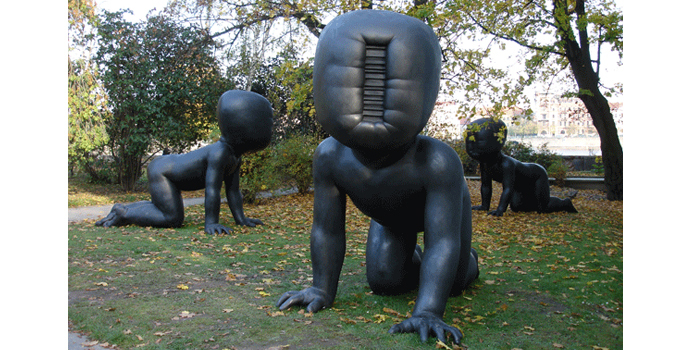 Like their bronze counterparts in Kampa Park, they are essentially faceless, having something like a bar code imprinted where their features should be. 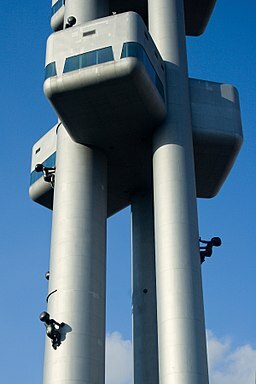 In fall 2017, Černý told As It Happens host Carol Off that the babies had been removed from the tower to be painted and repaired and would be replaced on the tower in spring 2018. BUT….and here’s where the mystery begins….they are not on the tower as of June 15, 2018. Also, the Desert Sun newspaper in Palm Springs (yes, U.S.) published a June 5 article titled, “Giant ‘Babies on the Move’ are unveiled in Palm Springs.” They are displayed in a sand pit viewable from the Rowan Hotel. Now, while living almost in the shadow of Žižkov Tower, I miss those strange, ugly babies and wonder if they have been kidnapped by some developers in the U.S. and will ever get a chance to climb their tower again. This entry was posted in Uncategorized and tagged David Černý, Prague, Žižkov Television Tower babies by Candace Perkins Bowen. Bookmark the permalink.